Excel is a highly programmable product, and it's easily the best choice for developing spreadsheet-based applications. ■ File structure: The multisheet orientation makes it easy to organize an application's elements and store them in a single file. For example, a single workbook file can hold any number of worksheets and chart sheets. UserForms and VBA modules are stored with a workbook but are invisible to the end user. ■ Visual Basic for Applications: This macro language lets you create structured programs directly in Excel. This book focuses on using VBA, which, as you'll discover, is extremely powerful and relatively easy to learn. ■ Easy access to controls: Excel makes it very easy to add controls such as buttons, list boxes, and option buttons to a worksheet. Implementing these controls often requires little or no macro programming. ■ Custom dialog boxes: You can easily create professional-looking dialog boxes by creating UserForms. ■ Custom worksheet functions: With VBA, you can create custom worksheet functions to simplify formulas and calculations. ■ Customizable user interface: Developers have lots of control over the user interface. In previous versions, this involved creating custom menus and toolbars. In Excel 2007, it involves modifying the Ribbon. Changing the Excel 2007 interface is not as easy as it was in previous versions, but it's still possible. ■ Customizable shortcut menus: Using VBA, you can customize the right-click, contextsensitive shortcut menus. ■ Powerful data analysis options: Excel's PivotTable feature makes it easy to summarize large amounts of data with very little effort. 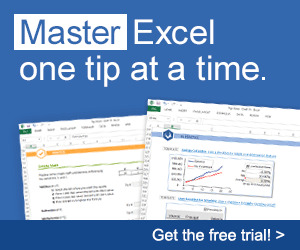 ■ Microsoft Query: You can access important data directly from the spreadsheet environment. Data sources include standard database file formats, text files, and Web pages. ■ Data Access Objects (DAO) and ActiveX Data Objects (ADO): These features make it easy to work with external databases by using VBA. ■ Extensive protection options: Your applications can be kept confidential and protected from changes by casual users. ■ Ability to create "compiled" add-ins: With a single command, you can create XLA add-in files that add new features to Excel. ■ Support for automation: With VBA, you can control other applications that support automation. For example, your VBA macro can generate a report in Microsoft Word. ■ Ability to create Web pages: It's easy to create a HyperText Markup Language (HTML) document from an Excel workbook. The HTML is very bloated, but it's readable by Web browsers.